I myself am made entirely of flaws, stitched together with good intentions. It’s always a delightful surprise to me when someone announces a giveaway on their blog! Lynn at Happiness is Cross-Stitching is giving away some very pretty things to celebrate the first anniversary of her blog. When I read about such generous people I wonder if I will manage to make it to a year of blogging myself. 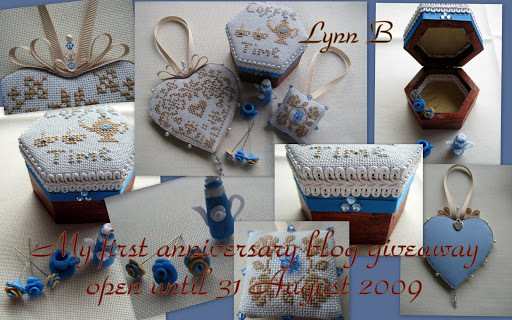 Here is a picture of Lynn’s first place prize which includes: a Box decorated with her own cross stitch design (the free pattern will be available to download when she return from her holidays); Coffee pot and cup; Rose pins; Heart shaped ornament with Swarovski crystal trim; Scissor fob with Swarovski crystals stitched 1 over 1. What an amazing assortment of goodies! We cannot live only for ourselves. Enter your email address to follow Sympathetic Threads and receive notifications of new posts by email.